It was an event to remember for NHRA motorycle fans. Top Fuel Harley pilot Beau Layne secured back-to-back event victories Sunday at the 50th annual Amalie Motor Oil NHRA Gatornationals at Gainesville Raceway. In the final second-year racer Layne defeated veteran Bob Malloy with a 6.47 at 217 mph to Malloy’s 7.24 at 187 mph. Layne, who was unsure if he could run the entire season, has now secured a new sponsor and the point lead. 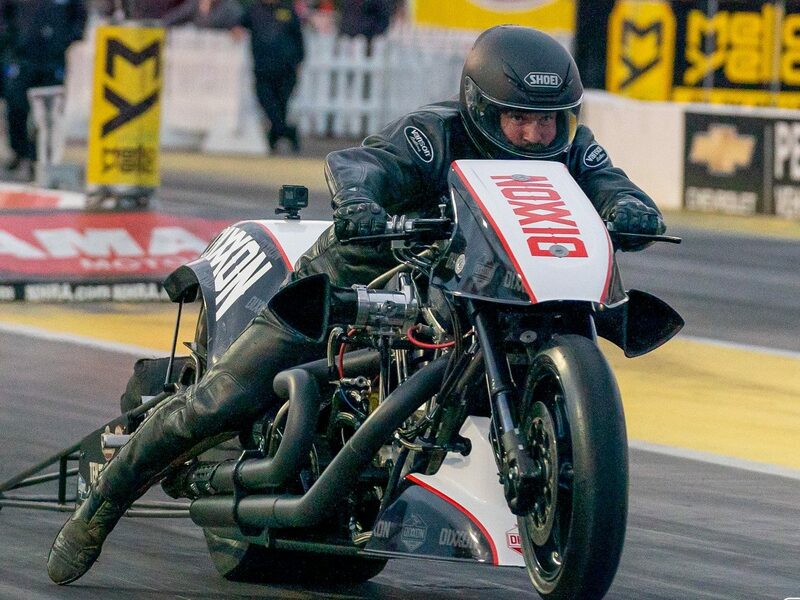 In Pro Stock Motorcyle Andrew Hines raced to his first win in the category since Pomona 2 2017 with a run of 6.752 at 199.17 on his Screamin’ Eagle Vance and Hines Harley-Davidson Street Rod. He defeated his teammate and defending event winner Eddie Krawiec for a rematch of the finals from 2018. Krawiec was the No. 1 qualifier for the event and secured his 49th career victory. The Gatornationals kicked off with track temperatures on Friday’s first two sessions fluctuating between 109 and 114 degrees. Drivers and crew chiefs had their work cut out for them. However, Saturday’s cloudy skies and low air and track temperatures served as a recipe for big elapse times and speeds. After Hector Arana, Jr. was the first to go 200 MPH in PSM in 2018, the event stole the show again. This past Friday, Matt Smith reset the Gainesville Raceway track record, running 201.76 mph. Smith was also involved in the first side-by-side 200 MPH pass in NHRA PSM history, sharing that stage with Eddie Krawiec. Saturday the track record, along with the national record, was reset again by Andrew Hines. Hines ran a 6.720 elapsed time (ET) that not only set a track record but also set an NHRA national record. For the first time in the 2019 NHRA Mello Yello Drag Racing Series, Gainesville Raceway featured a sellout crowd for Saturday’s qualifying sessions as they celebrated 50 years of this prestigious race. This track has been thought of as one of the fastest on the circuit and the event is one of the sport’s most revered, abundant with history-making performances. The respected raceway has entertained fans for decades, providing notable drag racing that will be forever etched in history. SEMIFINALS — Krawiec, 6.819, 197.08 def. Gladstone, 6.850, 194.72; Hines, 6.758, 199.08 def. Arana Jr, Foul – Red Light; FINAL — Hines, 6.752, 199.17 def. Krawiec, 6.762, 198.90. 1. Andrew Hines, 124; 2. Eddie Krawiec, 106; 3. Hector Arana Jr, 76; 4. Joey Gladstone, 72; 5. Matt Smith, 63; 6. Ryan Oehler, 54; 7. (tie) Jerry Savoie, 53; Jim Underdahl, 53; 9. Angelle Sampey, 35; 10. (tie) Hector Arana, 32; Karen Stoffer, 32; Melissa Surber, 32.